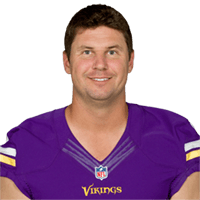 Published: Sept. 11, 2016 at 03:50 p.m.
Minnesota Vikings quarterback Shaun Hill finds wide receiver Stefon Diggs for the 33-yard basket catch. Published: Aug. 28, 2016 at 02:57 p.m.
Vikings wide receiver Cordarrelle Patterson recovers tight end Mycole Pruitt's fumble in the end zone for a touchdown. Published: Aug. 22, 2015 at 10:45 p.m.
Minnesota Vikings tight end Chase Ford catches a 4-yard touchdown from quarterback Shaun Hill. Published: Aug. 15, 2015 at 10:00 p.m.
Minnesota Vikings quarterback Shaun Hill launches one up for wide receiver Cordarrelle Patterson, who brings down the ball for a preseason touchdown catch.